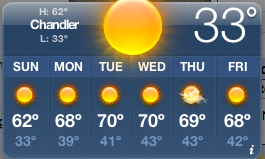 So yes it got below freezing in Chandler AZ sometime..
Can you Share a Little Holiday Cheer? Hope you had a relaxing weekend. Too bad this is the only time Hayden was being nice... even if he was on the couch. Christmas countdown is here. I think we are ready. The tree is up, lights are bright, presents almost complete, and baking to be complete. Kick me in the Holidays. Bek and Luke helped to kick off the holidays with us. American Style not Aussie Way... We had a 23 year old birthday party like 5 year-olds! Yes for Zoolights on my Birthday! Hot Liz on what we like to call a Sea Otter. Aww Stingrays coming right at mines.